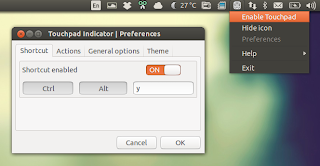 Touchpad Indicator is an Ubuntu AppIndicator which, like the name suggests, allows you to easily enable or disable your laptop touchpad. This is useful if your laptop doesn't have a touchpad toggle key or if the key doesn't work. The application comes with an optional keyboard shortcut to enable/disable the touchpad, can automatically disable the touchpad when a mouse is plugged in and more. Touchpad Indicator 0.9.5, release recently, introduces mouse wheel support for the AppIndicator so you can toggle the touchpad status by scrolling on the AppIndicator icon. Touchpad Indicator is developed by Lorenzo Carbonell from atareao.es, who's also behind other popular AppIndicators such as My Weather Indicator or Google Calendar Indicator. There's also a package for Ubuntu 12.04 in the same PPA, but unfortunately it hasn't been updated to the latest Touchpad Indicator version, probably because of some dependency issues.